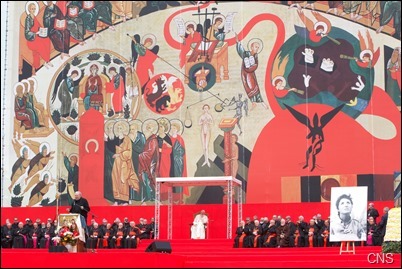 Following my time in Altotting, Germany, which I told you about last week, I returned to Rome to participate in the celebration of the 50th anniversary of the presence of the Neocatechumenal Way in Rome on Saturday. 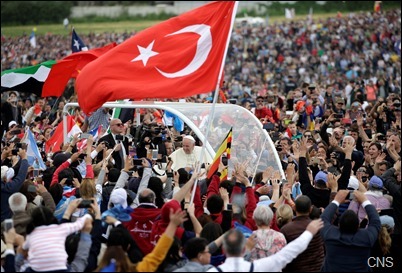 There were about 100,000 people from over 100 countries – including about 200 from Boston – there to be together with the Holy Father for the event. 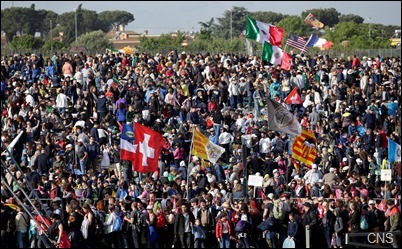 It was held at the Tor Vergata university compound on the outskirts of Rome, the same place where the gathering was held in the year 2000 for World Youth Day. 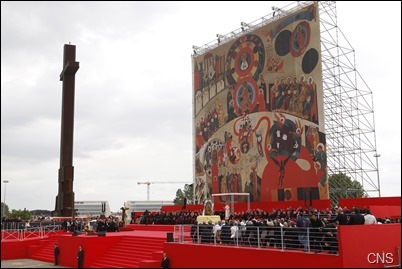 The Holy Father arrived at 11 o’clock and addressed the crowd. It was a beautiful reflection and very appropriate for the 50th anniversary. 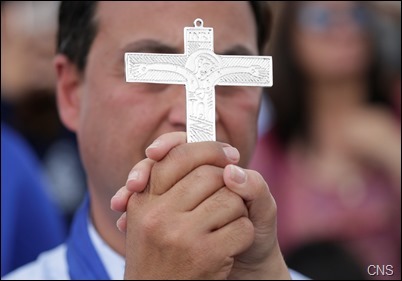 Then, he blessed families and priests who are going in mission throughout the world and presented them each with a mission cross. 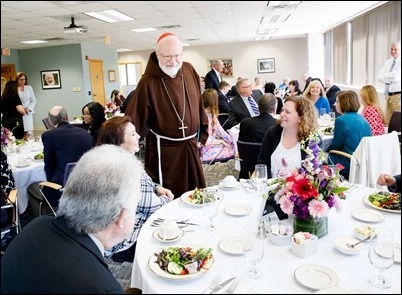 Following the celebration, we were invited back to the Redemptoris Mater Seminary of Rome for a lunch with the bishops and other people who were in attendance. 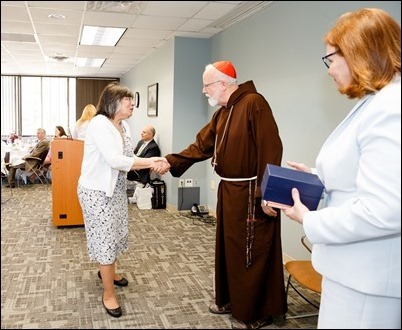 It was also the first opportunity I have had to meet Maria Ascensión Romero, who is now part of the worldwide leadership team for the Neocatechumenal Way, taking over for Carmen Hernandez who died in 2016. The meeting was a great success and a wonderful way to mark the 50th anniversary of the Way in Rome. It is amazing to think that in just 50 years there could be so much growth coming out of this charism of renewing people’s baptismal formation and commitment and to think how it has resulted in so many communities being formed and seminaries being erected. It has really been a great blessing for the Church. By Monday I was back in Boston and went to Resurrection of Our Lord and Savior Jesus Christ Church in Hingham for the funeral of Father Ed Condon. In addition to his many local assignments, Father Condon served as a Navy chaplain for about 25 years before returning to the archdiocese to serve at St. Denis Parish in Westwood, where he was much appreciated. It was a very beautiful celebration and the church was packed with his many friends, family and loved ones. 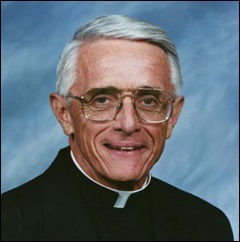 Of course, he dedicated many of years of his ministry to caring for retired and elderly priests. So, he is much beloved by his brother priests, and nearly 70 of them also joined us to be a part of the funeral Mass. A fellow former Navy chaplain, Father Charles Bourke, gave a beautiful homily and at the end of Mass, his brother, Robert Condon, offered a reflection on his life. I was very lucky to be able to have spent some time with Father Ed just before he died. I was very edified by his faith and courage, as he faced his last illness. He was indeed a fine priest and I was happy to be a part of the funeral celebration. That evening, I attended our inaugural Sts. Martha and Mary Dinner at St. Mary Parish in Brookline. 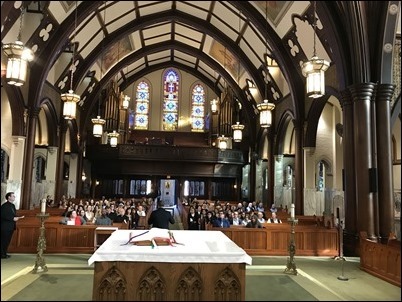 This was our first gathering for young women of high school or college age who are considering a vocation to religious life. It had been suggested that we hold a gathering for young women similar to our St. Andrew Dinners for young men considering the priesthood. So, our Vocations Office working closely with our Delegate for Religious, Sister Marian Batho, worked to organize the gathering and invite religious communities to send representatives. In the end, there were representatives of about 15 communities there with us. We were so pleased that about 100 young women were with us for the evening. 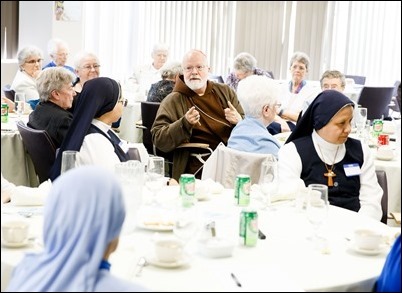 Similar to the St. Andrew Dinners, the evening began with Vespers followed by dinner and then a time of conversation with opportunities for the young women to gather with individual religious sisters. 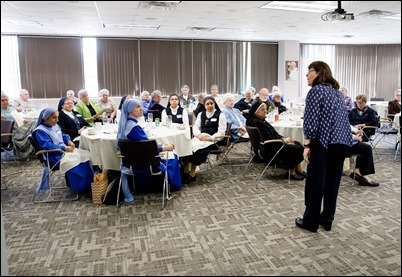 We also heard witness talks by Sister Veritas of the Sisters of Our Lady of Mercy and Sister Guadalupe Karol of the Daughters of Mary of Nazareth. After the two witness talks, I addressed the group and we concluded with a blessing. 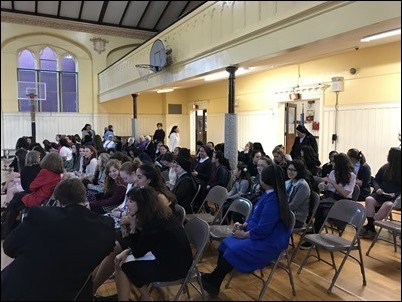 I was very impressed at the number of young women who came to participate, and this is certainly something that we will continue going forward. 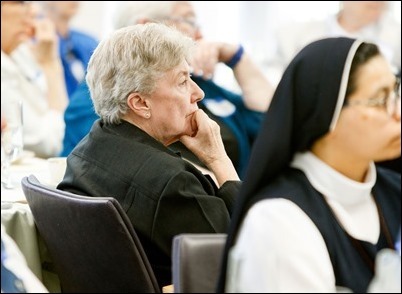 It is a great concern that religious life is diminishing numerically in the archdiocese. 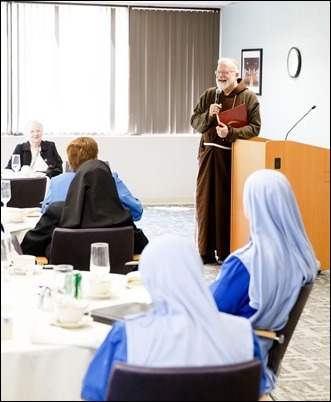 So, it was very encouraging to see that so many young women would have an interest in learning more about religious life, and perhaps consider a vocation to consecrated life for themselves. 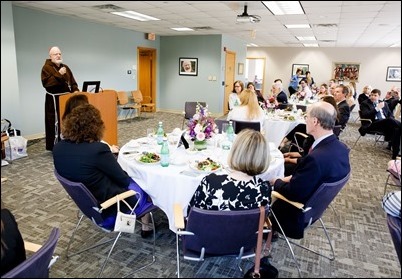 The following day, we had our luncheon to honor the recipients of our Archdiocese of Boston Excellence in Teaching Award. 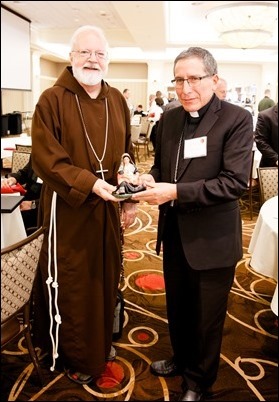 This was our first year presenting the award, which was created by the Catholic Schools Office, with the support of the Catholic Schools Foundation. 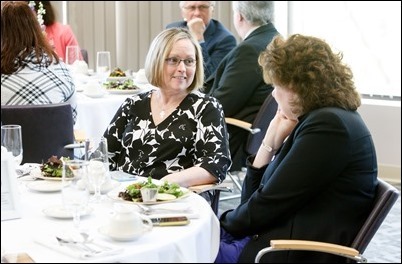 It was presented to five elementary and five secondary school teachers who were among the many nominated by their school communities. 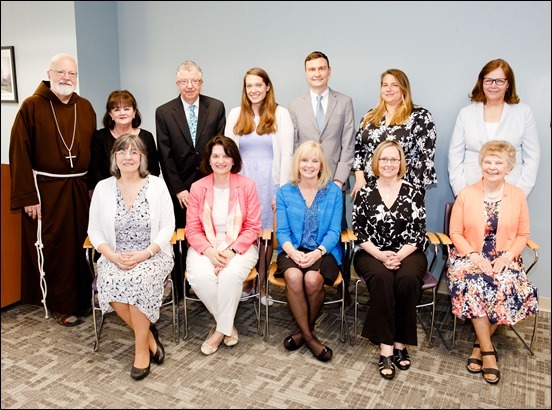 We are so grateful to these men and women who have devoted themselves to teaching in our Catholic schools, and they do so often at great sacrifice. They are participating in the same mission that so many of our religious women and brothers did for so many years and without them we would not have our Catholic schools. 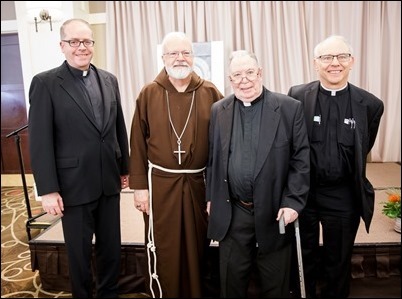 Many of them have served for decades in our Catholic schools and we are delighted that they were being recognized for their commitment to Catholic education and to passing on the faith. 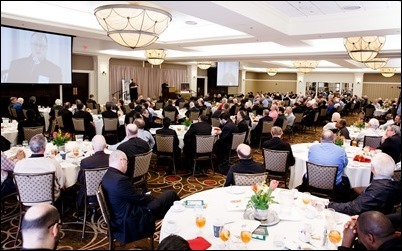 Wednesday, we held our annual spring convocation for the priests of the archdiocese at the Four Points by Sheraton in Norwood. This is one of the occasions during the year that we gather with the whole presbyterate for a day of fraternity and reflection on our vocation. We are grateful that so many of our priests were able to join us for the day. We were also happy to be joined by Bishop Pedro Bustamante from Peru who is here visiting with the St. James Society. 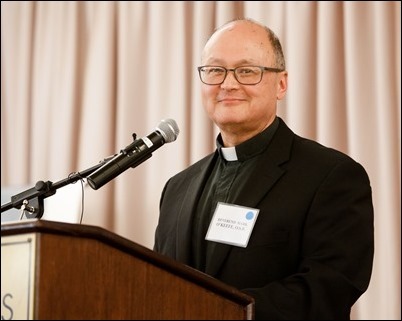 We began the day with midday prayer followed by some updates for the priests on some administrative items, including the installation of the new solar panels at the Pastoral Center. 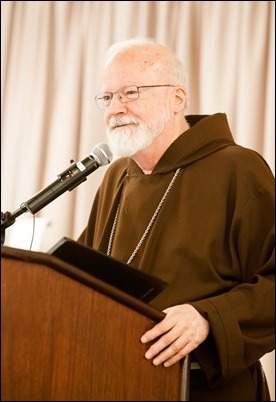 Our keynote speaker was Father Mark O’Keefe, who is a Benedictine monk whose entire life has been devoted to the formation of diocesan priests as a professor and rector at St. Meinrad Seminary in Indiana, as well as authoring many wonderful books on priestly spirituality. 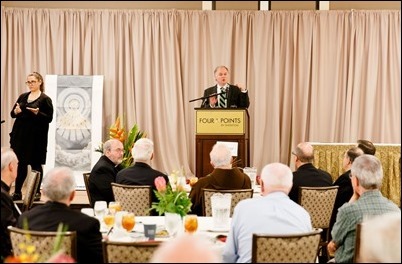 We were delighted that he was able to come and address our priests. We were also very edified by a brief witness talk given by Father Michael Nolan, who is recovering from cancer and wanted to thank the priests for their prayers and support. During our gathering, we honored three priests nominated by their peers. 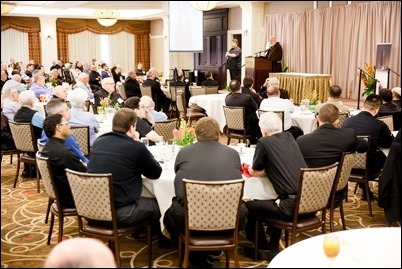 This was traditionally done at the luncheon following the Chrism Mass each year, but in recent years we have been presenting the awards at the convocation. 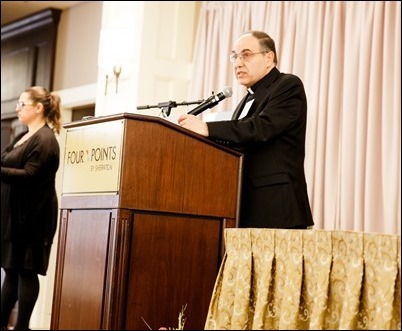 This year we honored Father Sean Connor, the pastor of the Sacred Heart-St. Thomas More Collaborative in Braintree; Msgr. Peter Martocchio, a senior priest who resides at Regina Cleri; and Father Phil McGaugh, the administrator of St. Mary Parish in Randolph. 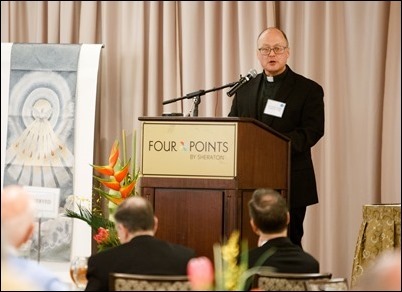 I also addressed the priests and we concluded the gathering with remarks by our Vicar General Bishop Peter Uglietto. It was a wonderful day to be together and the priests always exhibit great joy to be able to gather with their brothers and have time for socializing. 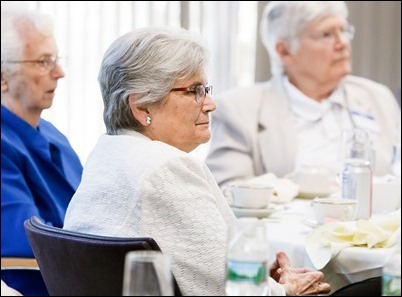 On Thursday, we had our annual meeting with the superiors of women religious orders in the archdiocese. 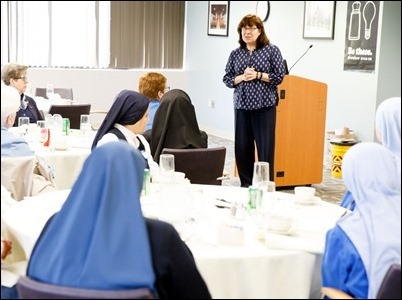 Sister Barbara Gutierrez of our Catholic Schools Office gave them a presentation on our efforts to increase outreach to Hispanics and other ethnic groups in our Catholic schools. Following sister’s talk, I addressed the women and we had a time of questions and answers. 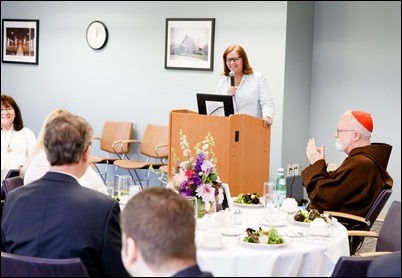 I was very happy to report to them on the success of the St. Martha and Mary dinner and I told them of my own experience growing up, and how important religious were in my own education and upbringing. In fact, as I told them, the first time I had a lay teacher was in graduate school! 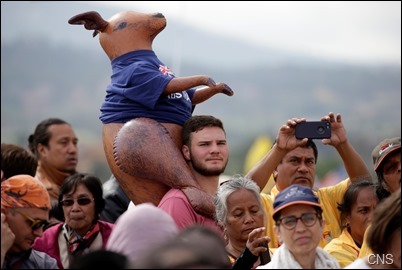 But today, we have many young people who are growing up without having a chance to get to know a religious sister or brother – something that is unthinkable to many of us of older generations. So, I told them how important their own witnesses is, and how vital it is that we continue to promote vocations to religious life.